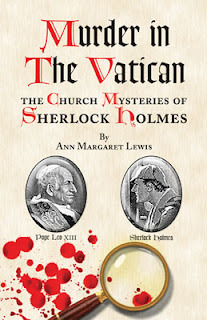 A Pius Geek: Interview with "Murder in the Vatican" author Ann Margaret Lewis. Interview with "Murder in the Vatican" author Ann Margaret Lewis. After yesterday's guest blog by the very generous author of Murder in the Vatican, Ann Margaret Lewis, you didn't think things could get better, did you? Today, Ann Margaret Lewis has willingly submitted to questions from the A Pius Man blog. You will notice that some of the questions are numbered differently. These are questions that came with the press packet that I believed readers of this blog might be interested in. The questions I came up with are plainly numbered, with no additional lettering ... you'll see what I mean. We here at the A Pius Man blog would like to thank Madam Lewis for her time. Murder in the Vatican can purchased through the publisher, wessexpress.com. It is also carried on ignatius.com and Amazon. If readers have more questions, Ann can be reached by email via her web site: http://www.holmeschurchmysteries.com/. It was fun answering your interview questions, John. Thank you! The Guest Blog Index -- "Catholic fiction"
GOD H8TS JAPAN; Twitting with Phelps & Co.